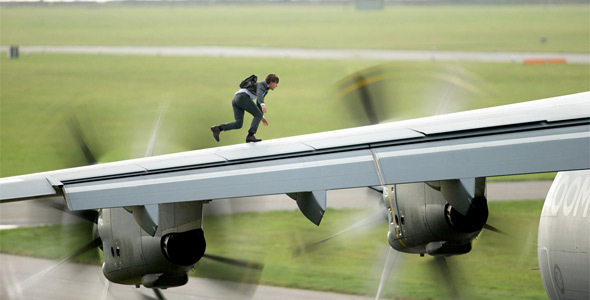 The first time we see Tom Cruise's Ethan Hunt in Mission: Impossible - Rogue Nation he's running. Of course, he's running. The only activity the physically impressive actor does in this franchise more than run is perform insane, death-defying stunts. Like hang off the side of a plane as it takes off. Don't worry. That comes shortly after the running. This is all to say that Rogue Nation knows where the strengths of its franchise lie. It has taken five films, but the people behind these films have cracked the formula. While the narrative appears to coast on auto-pilot, it's execution makes for Grade A, blockbuster entertainment, an exhilarating cap to the Summer, movie season. No, Fantastic Four was not forgotten. I mean what I say. What Hunt is running towards in those opening moments eventually develops into the inevitable. There's a dark organization bent on controlling the world, it quickly brings Ethan Hunt to his knees, and our protagonist along with his amazing team of special agents come back to kick a little, evil tail. It's a structure that's been working far long than this franchise has been around. That was standard, spy-thriller fair before the "Mission: Impossible" TV series began its seven-season run in 1966. Don't let the familiarity of its plot fool you, though. Rogue Nation is the most straightforward Impossible Missions Force adventure put to film yet, but this aspect has a strong hand in keeping the film light and entertaining. After five films we know Cruise's Hunt isn't going to bite the bullet, and it's a pretty good assumption to make about the members of his team, as well. We know the character personification of the overbearing bureaucrats, this time played by Alec Baldwin as the head of the CIA, is going to doubt everything about Hunt only to have his nose rubbed in it when "Maverick" saves the day. To a very large degree, Rogue Nation's screenplay doesn't disappoint when it comes to conflict without any real drama. Perhaps now is the best time for a one-off Mission: Impossible movie that adds little to the Ethan Hunt character and just delivers the high-octane thrills. The team the character has built around him over the first, four films is made up of a solid group of actors: Jeremy Renner, Simon Pegg, and Ving Rhames. It's always a nice return to these characters, the time between Mission: Impossible films serving to make it seem as if some of them have been around much longer than they actually have. Add to that group the beautiful and badass Rebecca Ferguson as the femme fatale with whom Hunt is obsessed, another standard-issue element to these films. That's the team we're all rooting for with Rogue Nation. The opposing team of antagonists are lead by the peculiar Sean Harris, but his motivations are as general as the film's overall synopsis. Again, don't let the routine structure of its story fool you into thinking this film isn't worthwhile, and most, if not all, of that credit lays at the feet of Rogue Nation's director and co-writer, Christopher McQuarrie. McQuarrie proved he was a helluva writer with 1995's The Usual Suspects, and he proved he was a helluva director in 2000 with The Way of the Gun, which he also wrote. Rogue Nation makes the second time - after Jack Reacher - that the director has worked with Tom Cruise, and you can already tell McQuarrie knows how to use his star. Not only that, McQuarrie knows exactly how to utilize every aspect of the franchise he's now representing. That goes for gears and gadgets, of which Rogue Nation has an abundance. Even the classic IMF masks make a few appearances here. More than that, though, McQuarrie can direct the hell out of an action scene, of which Rogue Nation has an overabundance. There's nothing as massive as Ghost Protocol's sandstorm or even the first Mission: Impossible's train chase, but the action in Rogue Nation hits early and hits often. It's all impressively staged, a chase sequence in the middle serving as a major high point. He applies his actors well, too, all of them allowed their hand at both serious and comedic relief moments. These moments usually go hand-in-hand, often in the same scene, but it all feels natural to what's going on in the characters' surroundings. Tom Cruise looks naturally terrified as he's hanging off the side of that plane, obvious reasons for that aside, but McQuarrie captures that fear even with the single, wide-shot. On the flip side of that, Pegg pulls off the single, funniest moment in the entire franchise, and it's with a small point of the finger. All of that is indicative of why Mission: Impossible - Rogue Nation is so effortlessly enjoyable. McQuarrie didn't try to take this series down the same, dark alleys so many franchises such as this have taken. He didn't try to shake it all up with twists and turns that completely altar the course of the franchise. To put it in television series terms, Rogue Nation is a mid-season, stand-alone, filler episode, but it's a whole, helluva lot of fun. 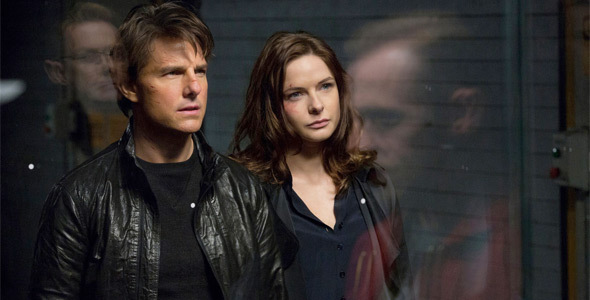 The Mission: Impossible franchise's future is as inevitable as Hunt's victories in the field. They might not be able to pull off too many of these straightforward, one-off entries, but, for what it is, Rogue Nation is a satisfying smash. The first half is nice. But the second half drove some people away from the screen and back to their smartphones. I suppose that's why they had to re-shoot some of scenes of the movie. It had the same tempo of up and down, up and down without a significant crescendo in the end... felt like and episode in a tv show. Thanks for the review Jeremy! I am checking it out later this weekend! Whether or not you intended it, Bo, many of your previous comments concerning Tom Cruise were perceived as antagonizing. Repeat, whether you intended (or not). I actually stayed away from the Mission Impossible series kinda because they're trying to hard to be like JAMES BOND type movies , but ROGUE NATION will out do SPECTRE ( even though it's not out yet ) , that's how good M.I. 5 is !!!!!! 2 thumbs up all day !!! !